As part of the implementation programme we were asked to develop and manufacture a range of fixtures for the latest Ivy Park and Kate Moss collection. It took only six weeks from the initial design discussions for the Kate Moss project to hit the shop floor. The launches at TopShop’s flagship London and Berlin stores were a great success, and the fixtures sat perfectly within the star-studded event. 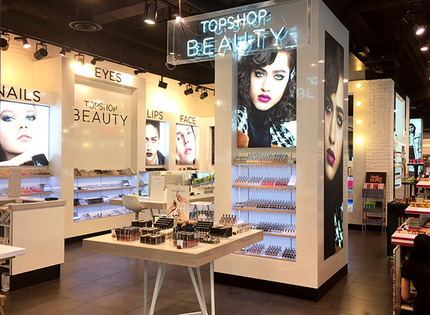 Principle also create general fixtures for TopShop, TopMan and Miss Selfridge including an array of bespoke unitary. The fixtures are installed in over 100 stores around the world. Principle continues to work closely with the Arcadia team on their ongoing programmes.